Mixed-use development project under construction for a 2.2-acre parcel located across from the Forest Hills rapid transit station currently used as a surface parking lot. The Residences at Forest Hills will construct three wood-framed buildings containing approximately 250 residential rental apartments and 4,070 square feet of ground-floor retail. Apartments will include studios, one-bedrooms, two-bedrooms and three-bedrooms. 50 apartments will be designated affordable. A lower level parking garage will be constructed containing 130 vehicle spaces. 10 additional surface parking spaces will be reserved for short-term visitors. 250 covered bicycle parking spaces will be provided for residents. The Residences at Forest Hills is targeting a minimum of LEED Silver sustainability certification. With wood framing ongoing for the 2nd and 3rd buildings in the project, window install has started for the first building at The Residences at Forest Hills. When complete the project will feature around 250 apartment and just over 4,000 square feet of retail just across the street from The Forest Hills MBTA Station. Resident amenities will include a fitness center, yoga studio, clubhouse with teaching kitchen, theater room, bicycle storage, and bicycle maintenance areas, and electric vehicle charging stations. Various phases of construction are ongoing for the two new buildings that will make up the Residences at Forest Hills. The mixed-use project just across the street from Forest Hills station will feature 250 units along with 5,500 square feet of ground floor retail and restaurant space. 50 units within the project will be designated affordable. Resident amenities will include a fitness center with yoga studio, clubhouse with a teaching kitchen, and a theater room. Concrete cores for the three buildings that will make up the Residences at Forest Hills are rising and wood framing has also begun. The project is set to include around 250 apartments, 50 of which will be affordable. Unit sizes will range from studios through three bedrooms. There will also be parking onsite for 130 cars and 250 bicycles along with around 4,000sf of ground floor retail. Criterion Development Partners has acquired the 2.2-acre site of its' approved 250-unit Residences at Forest Hills development, located across from Forest Hills Station, for $11.75 million. Criterion received approval from the City of Boston’s Zoning Board of Appeals (ZBA) to construct the $101 million, 235,000-square-foot project last summer. The project site is currently used as a surface commuter parking lot. The Residences at Forest Hills will also include 4,070 square feet of ground-floor retail and will be composed of three new buildings. Last week, the City of Boston’s Zoning Board of Appeals (ZBA) approved The Residences at Forest Hills, a new mixed-use development in Jamaica Plain featuring 250 apartment residences with 4,070 square feet of ground-floor retail. The project has now received all necessary approvals and can proceed with construction. The $101 million Residences at Forest Hills will replace an existing commuter parking lot located across from the Forest Hills rapid transit station with three new buildings. The Residences at Forest Hills, a 235,000 square foot mixed-use development located across from Forest Hills Station in Jamaica Plain, was approved at last Thursday (January 12th)’s Boston Planning & Development Agency (BPDA) Board Meeting. The $101 million project will construct three new buildings containing 250 residential apartments and 4,070 square feet of ground-floor retail on an existing commuter surface parking lot. The Residences at Forest Hills will now go before the Zoning Board of Appeals (ZBA) for review. Approval by the ZBA is required in order for the project to proceed. Criterion Development Partners submitted a Project Notification Form (PNF) to the Boston Planning & Development Agency (BPDA) yesterday (October 20th, 2016) with new details and renderings for The Residences at Forest Hills, a proposed 280,000 square foot development that would be located across from the Forest Hills rapid transit station; the following is a link to the PNF. The Residences at Forest Hills would construct three new buildings in one phase containing approximately 252 residential rental apartments and 5,500 square feet of ground-floor retail. Additional information about the proposed Residences at Forest Hills can be found above. 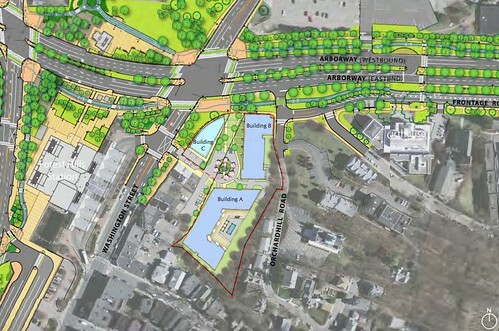 Criterion Development Partners (CDP) has filed a Letter of Intent (LOI) with the Boston Redevelopment Authority (BRA) to construct a mixed-use development project on the existing two-acre parking lot at the corner of Washington Street and Arborway in Jamaica Plain located across from the Forest Hills rapid transit station. The following is a link to the Letter of Intent. As previously reported, the project would include approximately 260 residential apartments. Per the LOI, units would range from studios to three-bedrooms and would also include "three-bedroom townhouse" units. The project would include an affordable housing component "in excess of that required" by the City of Boston's Inclusionary Development Policy (IDP). Per the LOI, approximately 5,500 square feet of retail would be located on site, down from previously reported 6,000 square feet. The project would be constructed across three new wood-frame buildings above a single-level parking garage. A total of approximately 136 parking spaces would be constructed on site, including approximately 10 surface parking spaces. The project would provide Zipcar spaces and a community bike-share facility. 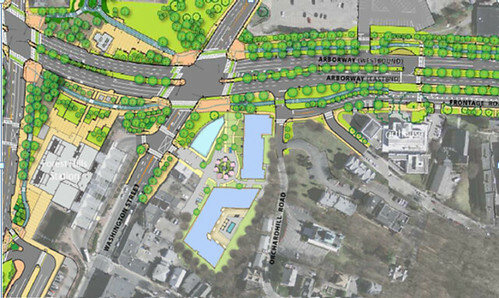 Jamaica Plain Gazette reports that Criterion Development Partners plans to construct a new mixed-use development project on the LAZ surface parking lot located across from Forest Hills Station at the corner of Washington Street and Arborway in Jamaica Plain. An aerial view of the parking lot is posted above. The development team plans to file a Project Notification Form (PNF) with the Boston Redevelopment Authority (BRA) in 45 to 60 days. The proposed project would include approximately 260 residential units and 6,000 square feet of retail. A single-level underground parking garage would be built on site as well as some surface parking spaces. 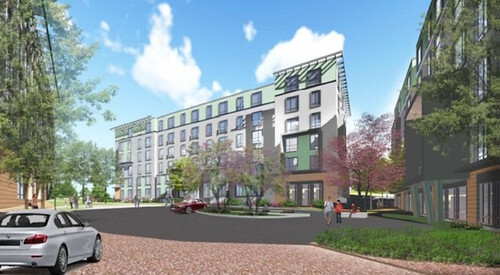 MetroMark Apartments, a mixed-use development project including approximately 283 rental residential units and 5,000 square feet of retail space, is under construction across Arborway from the proposed project site.